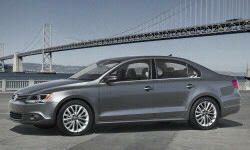 Why the 2012 Volkswagen Jetta? I drive 80 miles a day, 70/30 highway/city. I average 39 mpg per tank driving at an average 75 mph on highway. My normal range before I fill up is about 530 miles according to the trip computer, and there is still more than an 8th of tank left. Navigation is very easy to use, Fender audio system is more than enough oomph for the average driver, great bass. I drive an average of 20,000 miles per year and am currently on track to put more than 40,000 miles in two years of ownership. Not one problem whatsoever. No visits to dealership other than routine maintenance. Very solid vehicle so far. Why Not the 2012 Volkswagen Jetta? There a very few things I don't like about my TDI, but there is one very minor (but very annoying) thing. One of my doors' inside rubber lining will not stay in place in one particular spot sometimes making it stick out very slightly when the door is closed. Again, this is minor but still annoying. Other than that I have no complaints whatsoever with the car.